If you are a regular seascape shooter you will already know the pain and frustration felt when the wind blows directly at you and wipes up a lot of sea spray. 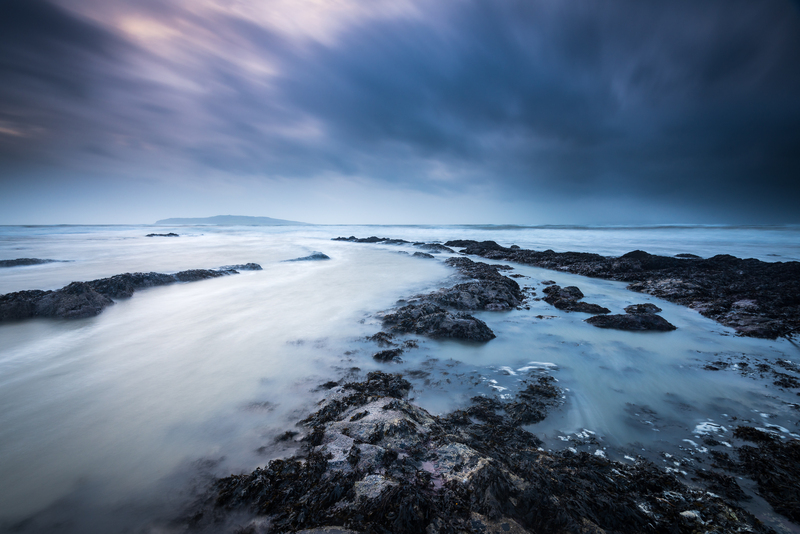 Within seconds your filters, lens and camera can be covered in a fine salty mist. This can ruin the best of images and leave the photographer frustrated from constantly cleaning filters. Some manufacturers have promised water resistant filters which will deal with these issues but I have yet to test any of these. I am going to share some easy & very practical options to deal with sea spray in the field and in post production. These tips are also helpful when shooting in light rain. This one is simple. Move back from the water’s edge and compose a wider scene where the worst of the spray cannot reach you. From here, you can possibly use a longer lens to zoom in closer on your subject. If like me, you love to capture the movement of the water, you can look for a different composition where the wind is not blowing directly at you – look to the left and right and investigate what is around. Take a walk to another location if you need to or even find shelter behind a large rock, pier or sea defence if you can. Carry a small spray bottle of cleaning fluid and lots of lens cloths with you. This can be purchased in most opticians and does not take up a lot of space at the bottom of your camera bag (just make sure it does not leak in the bag). Cleaning salt water or sea spray from a filter is a difficult task – wiping alone generally leaves a misty residue on the filter which you just end up moving around by wiping with a cloth alone. 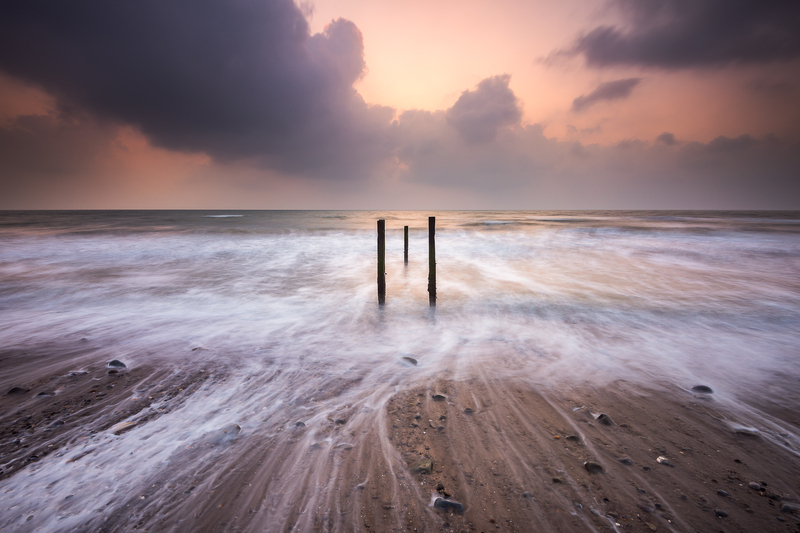 My best tip for cleaning sea spray from filters is simple – lick them. You should be able to taste the salt. When you can no longer taste salt, wipe them dry. Sounds stupid but give it a try – it works. I know from experience that exposure to sea spray will rust any metallic surfaces on your camera and lens over time. My camera is weather sealed but I still get rusted screws which do not look good. I recently returned it to Nikon to have the screw replaced as it was still under warranty. They refused claiming water damage and my local camera stockist had to fight hard to get them to accept liability and replace the screws free of charge. Avoid this by keeping your camera well covered in these conditions. This can be done with a customised cover, plastic bag or even a lens cloth or shower cap sitting on top of your camera. If you shoot with a slotted filter system such as Lee Filters you can combine several filters together. This comes in really handy in the field as you can easily place an un-needed filter at the front of the system. This acts as protection for the required filters allowing you to align everything perfectly. Then when the time is right, simply remove the front filter, click and replace it again as quickly as possible. Another alternative to this approach is to use a clear shower cap across your filter system. It will allow you compose your scene and align filters. The principle is exactly the same. It can be difficult to see the fine detail of your images on the back of a camera. If you’ve taken all the precautions above and arrive home to still find a little mist on your images there are still some options. My 1st port of call is to try to use the De-haze tool in Lightroom as it can help reduce haze/mist drastically. However, be very subtle with the slider as moving it too far to the right hand side can look unnatural in an image.